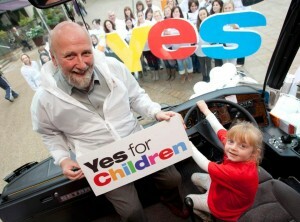 The upcoming Children’s Referendum could bring about major changes in the Irish Constitution. The wording of the proposed constitutional amendment on children’s rights has been published, ahead of the Children’s Referendum. The amendment, if approved by the electorate, affirms the rights of the child and allows the State to ”supply the place” of parents in exceptional circumstances. It also recognises the natural and “must have” rights of all children. If parents are found to fail in their duty towards their children, the State, in exceptional circumstances, will try to take their place with due regard to the rights of the child, regardless of the parents’ marital status. And if parents continue to fail in their responsibility, this amendment provides for the adoption of these children, irrespective of the parents’ marital status. Married parents can also, for the first time, choose to put their child up for adoption if they feel the child would be better cared for by someone else. “The best interests of the child will always be at the heart of both judicial and custody proceedings and, the view of the child must be heard and taken into account, with regard to the child’s age and maturity,” said Minister for Children and Youth Affairs Frances Fitzgerald in her Dáil speech introducing the amendment. However, the Irish Council of Civil Liberties is concerned the “voice of the child” will only be heard in proceedings when the state is on the child’s side rather than the other way round. MEP Kathy Sinnott also argues that the proposed amendment takes rights away from parents “This [proposed] wording and the other proposed wordings of the past all start from the premise that it is the State and not the parent who determines the best interests of the child,” she told RTÉ Radio One’s Morning Ireland programme.